Changes have also been made to the NHSGGC Gluten Free guidelines. In September this year, Coeliac UK published their updated prescribing guidelines. The main changes are: the recommendation that sweet biscuits, are only prescribed in exceptional circumstances and only on clinical advice. The additional units allocated for high physical activity level (PAL) have been removed. We have updated our guidelines in accordance with these changes to the Coeliac UK guidance. As you will be aware, we update our Gluten Free guidance quarterly. Gluten Free products that are not on this updated list are likely to be not ACBS approved and as such, not prescribable. Both updates are available under the clinical guidelines section on staffnet (Click here) for the CHP's and on the team site for the pharmacy teams. We have been advised that calcipotriol (Dovonex®) cream was discontinued on the 1st October. Patients who receive this on a regular basis should be reviewed and an alternative prescribed at the next available opportunity. The dermatology section of the Formulary is currently under review and the outcome of these discussions is expected in December. Healthy Start Vitamins are available to pregnant women and families with children aged 6 months to four years old, who are on income support. They receive vouchers which they take to a participating pharmacy in exchange for the vitamins. NHSGGC are also supporting the distribution of the Healthy Start vitamins to pregnant women and children aged one month to four years who are black skinned asylum seekers or failed asylum seekers due to the risk of Vitamin D deficiency; these people are provided with Sunshine Vitamin Club cards which can be taken to the participating pharmacies to receive the vitamins. Healthy Start Vitamins are not prescribable on a GP10 or stock order. 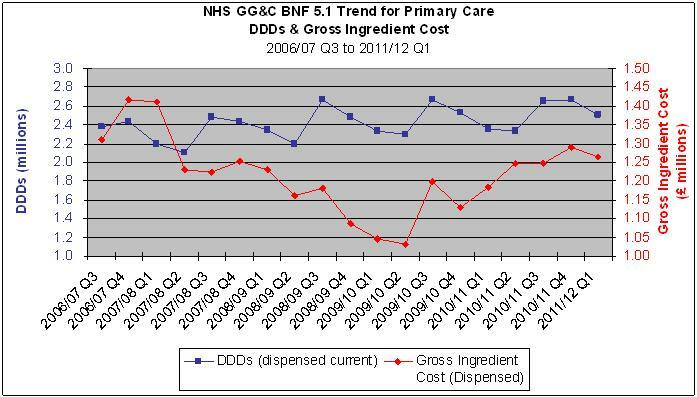 Across NHS Scotland almost all Health Boards support prescribing only of 2.5mg methotrexate tablets. In 2009, the NHSGGC Area Drug and Therapeutics Committee (ADTC) decided that the only oral methotrexate tablet strength to be used across NHSGGC was the 2.5mg strength and this is stated in the Formulary. The Local Medical Committee (LMC) has recently agreed to support a voluntary ban on 10mg tablets from 1st April 2012. A number of hospital dispensaries have already made the decision to only stock and supply 2.5mg methotrexate tablets. There have been a number of recently reported significant events that have occurred within NHSGGC. In addition to this, there have been a number of interface issues specifically around discrepancies between the prescribed dose and the dose on the last letter from secondary care. 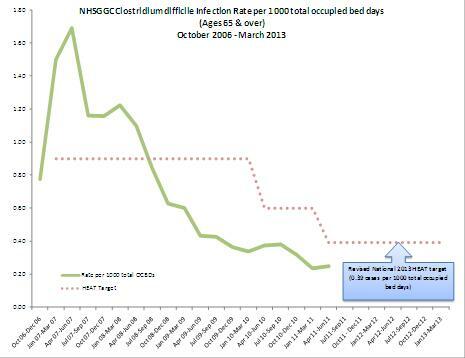 Infection Management Guidance for primary care was introduced in NHS Greater Glasgow and Clyde in July 2009. This was aimed at improving antimicrobial stewardship. The objective of the guidance was to reduce prescribing of the drugs at greater risk of promoting Clostridium difficile infection and to contain the increasing volume of antibiotic usage. 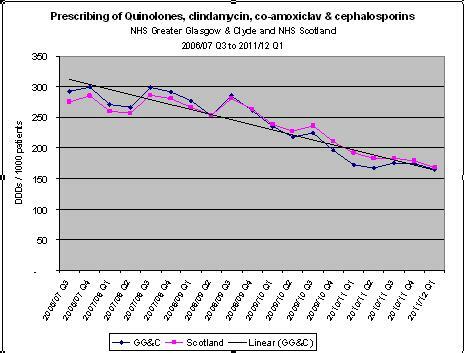 This bulletin presents both the prescribing patterns and rates of C. difficile infection identified within NHSGGC. The ‘4C’ antibiotics – Cephalosporins, co-amoxiclav, ciprofloxacin (quinolones) and clindamycin have been targetted both by limiting the recommendation for their use in the guidance and by removing cephalosporins from biochemistry urine sensitivity reports. The following charts illustrate the reducing trend in the use of these agents following the launch of the new guidance and the associated reduction in cases of C.difficile compared to the HEAT target. European Antibiotic Awareness Day is on the 18th November. This is an annual public awareness initiative to raise awareness about the threat to public health of antibiotic resistance and prudent antibiotic use. Prescribers are encouraged to participate in this day by displaying posters and leaflets about prudent use of antibiotics.